Save for brief summer growing seasons, tundras are among the most frigid regions on the planet. They are, therefore, devoid of trees. Arctic tundra, with its permanently frozen subsoil known as permafrost, occurs around the North Pole. Alpine tundra, which lacks permafrost, occurs on mountains at high altitudes. Cold-blooded animals cannot survive in tundra, but many mammals and birds with special adaptations call tundra home. The corpulent, long-haired musk ox is one of the ungulates, or hoofed animals, of the Canadian and Greenlandic arctic tundra. Roots, lichen and mosses make up most of its diet. The arctic tundra is also home to caribou, the only deer species in which both males and females have antlers. During the tundra's brief summer, North American caribou migrate to the northernmost part of their range to indulge in grasses; in the winter, they feed on lichen and mushrooms. Caribou are known as reindeer in Europe and Asia, where they have been domesticated. Ungulates in the alpine tundra of North America, found in places like Alaska and the Rocky Mountains, include elk, dall sheep and mountain goats. Cloven hooves with two toes make mountain goats excellent climbers. The arctic tundra supports one of the largest carnivores anywhere, the polar bear, which preys on seals and walruses. A special layer of fat insulates polar bears from the cold, helps them float in water and stores nutrients for when food is not available. 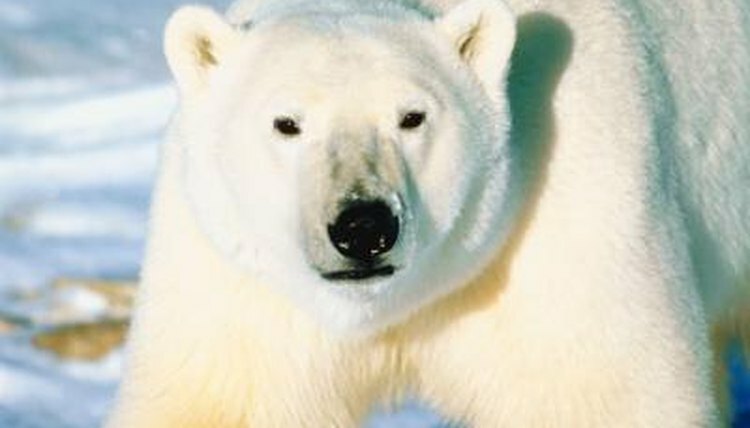 Polar bears share the tundra with arctic foxes, which prey on rodents and birds. When food is scarce, arctic foxes may follow polar bears in the hope of scoring some leftovers. The arctic fox's white winter coat turns brownish-gray in the summer. The wolf is another tundra predator. The arctic wolf of North America and Greenland feeds on musk oxen, caribou and arctic hares. Rodents that live in the tundra include lemmings, which turn from brown to white in the winter. Lemmings are known to migrate in large groups in search of sustenance, which in their case consists of plants and berries. Alpine tundra is home to marmots, a type of squirrel that has fur-covered ears and claws made for digging burrows. Marmots hibernate in the winter. Other small alpine tundra mammals, like pikas, stockpile food for consumption during the winter. The tundra is also home to rabbits, such as the arctic hare, found in North American arctic areas. Arctic hares change color, from white in the winter to blue-gray in the summer. The snowy owl lives in the arctic tundra year-round. Males are completely white; females have spots on their wings. Snowy owls prey on lemmings. Ptarmigans, herbivorous birds that the Smithsonian Arctic Studies Center describes as "chickenlike," are also year-round tundra dwellers. Their white winter plumage gives way to brown feathers in the summer. Other tundra birds are migratory, such as the tundra swan and the parasitic jaeger, named so because it forces other birds to give up their catches. A seabird most of the year, the jaeger returns to the arctic tundra in the summer to nest, as does the red-breasted goose, which breeds on the European arctic tundra.